The 211th Tactical Squadron of the 21st Tactical Air Base in Čáslav operates 12 single-seat JAS 39C Gripen fighter jets and 2 JAS 39D Gripen two-seat trainers. The Gripens were leased in 2005 to replace the outdated MiG-21s. The first six JAS 39s were delivered in April 2005, the delivery of all ordered aircraft was accomplished on 31st August 2005. The lease was agreed for a period of 10 years. In 2014 the lease was extended to 2027, or 2029 if the additional option is exercised, and the Saab service contract was extended to 2026. The aircraft will now undergo an extensive modernisation process. 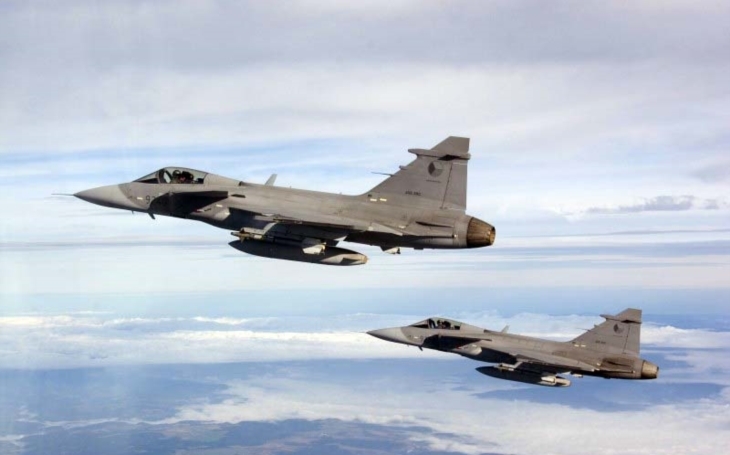 The Czech Gripens were already upgraded to acquire air-to-ground capabilities earlier this yearm with integration of the MS20 software upgrade. Saab technicians began installing the software upgrades into the Gripens at their home base in Čáslav on 12th March, and the entire fleet’s upgrade has been completed by April. Until than, the aircraft was only able to engage air targets and served exclusively to protect Czech airspace, and the airspareof the Alliance member states as part of NATO air policing of the Baltic states and Iceland. For that role the aircraft is armed with a 27 mm Mauser BK-27 revolver cannon with 120 rounds and with up to six short-range AIM-9 Sidewinder air-to-air missiles. The software upgrade allows the integration of the NATO-standard Link 16 datalink and Laser Designator Pods (LDPs) for air-to-ground and reconnaissance missions. The deliveries are expected by November under a procurement contract signed by the Czech Ministry of Defence and Rafael in May 2017. The Czech Gripens will be able to use the AGM-65 Maverick missiles, Paveway bombs (used with success by the Swedish Air Force to extinguish forest fire on 25th July) and GBU-39 Small Diameter Bombs. By 2020 the JAS 39 Gripen fighter jets will obtain the capability to engage ground targets with guided precision munition by conformable software integration, provision of standard NATO pylons and laser designator pod (LDP). Furthermore night vision googles and covert voice and data communication device will be provided. Identification mode of the transponder will be upgraded to the IFF Mode 5 standard. The IFF system consists of an airborne transponder and a ground (or airborne) interrogator. The system measures the distance and heading to the aircraft, and the transponder encodes identification and position information into the response. IFF Mode 5 is the most recent implementation of the system, in development for the last six years with companies including BAE, Raytheon, and Telephonics. It is now entering pilot production and the U.S. military is in the system integration and technical evaluation stage for the new systems and test support equipment. By 2025 the JAS 39 Gripen fighter jets will see integration of new types of air-to-air short and medium-range guided missiles. Their ground forces support capabilities by engaging and destroying ground targets at any wheather conditions, day and night, will be upgraded by introducing GPS guided air munitions. The satellite-guided weapons are not affected by degraded visibility of the ground target. The weapon can be employed in all weather conditions and does not need any ground support. GPS can be jammed, and in such case the guidance package reverts to inertial navigation, which is significantly less accurate. The 211th Squadron will return to Lithuania to conduct another air policing mission in the second semester of 2019.